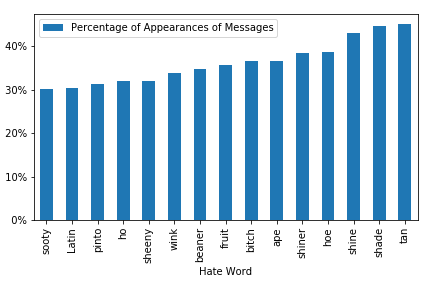 Identifying Hate with NTLK, difflib, and Python code! Recently, for our research project, we worked on identifying hate on anonymous platforms. We were inspired by the method of identifying hate outlined in the paper “Kek, Cucks, and God Emperor Trump: A Measurement Study of 4chan’s Politically Incorrect Forum and Its Effects on the Web”. print "Done getting API results"
print "Almost erased" + ChannelName + "Allfrequencies.json! Be careful!!!" And that’s it! This code does not detect the context of conversation such as sarcasm and solely tests for existence of words in messages.